Think about a goal that you have, the goal that has been tugging at your soul, the goal that makes you feel alive when you think about it, the goal that scares you because it is such a big goal. What is holding you back from reaching that goal? Is it the fear of failure? Is it the fear that others will judge you, or the fear that someone else will reach that goal and do it better than you? We hold ourselves back because we don’t think we are good enough to accomplish our goals. And then we watch others accomplishing their goals, and we get incredibly frustrated and feel like we have been left behind. I know exactly how this feels from experience, and it is not a fun place to be in. But when you think about your goals that scare you, why shouldn’t it be you who accomplishes those goals? You are deserving of reaching your goals, you are capable of achieving your wildest dreams, so why not you? Why just let others accomplish their goals, when you can too? What about anyone else makes them different that they are worthy of their dreams and you are not? Absolutely nothing. If you have a dream, and it fuels your passion, then it should 100% be you who reaches that dream. For my entire life, I thought I wasn’t worthy of many things in this world, and I especially did not think I was worthy of reaching my goals. The Ivy I used to be would answer the question, “Why not you?” with the answer, “Because I am not good enough, because I am not worthy”. The Ivy I have become and learned to cherish, now says, “Correct! Why not me? Why shouldn’t I be the one to reach my goals, take that risk, and chase my passion? There is no reason why I shouldn’t, and I will reach those goals because I am deserving and I am capable”. I want each and every one of you to do the work as well to change your mindset and see that you are worthy of reaching your goals. You can use your time on earth to see what kind of person you can become and to see what kind of influence you can have on others and on the world. You can make an impact as you move through your daily life, simply by being you. So what makes us worthy of reaching this goal and saying “Yes! Why not me?”. Well for starters, you exist, and by existing, you are worthy. You have a brain that has allowed you to create an idea, you have a brain that allows you to implement a plan to see that idea come to life, and you were given that idea for a reason, all things that make you worthy of reaching this goal. This idea, this passion, this goal, that is stirring within you, is stirring within you for a reason. I have always had an intense desire to help people and the way that I have wanted to help people has changed over the years, but the passion and center goal have remained the same. Because this goal and passion hasn’t gone away, I can remember I am worthy of taking risks to help people, such as being vulnerable with sharing my story. If this goal keeps knocking at your door in your head, let it be a constant reminder that the universe is telling you that you are worthy of reaching this goal and that you can start today to get one step closer. Remember that you are worthy, and that it should be you who achieves that goal and changes the world. Taking a risk to go after our goals can be incredibly scary, but that is what makes them exciting and what fuels our passion. Fear of failure can truly hold you back, but let’s remember the lessons that come from each and every failure. Without the failures in our life, we wouldn’t be as grateful for the successes. Each failure gets you to where you are supposed to be. If you can be positive with yourself, and remember that you are worthy, and you will end up exactly where you are supposed to be, you can be bigger than the fear of failure. 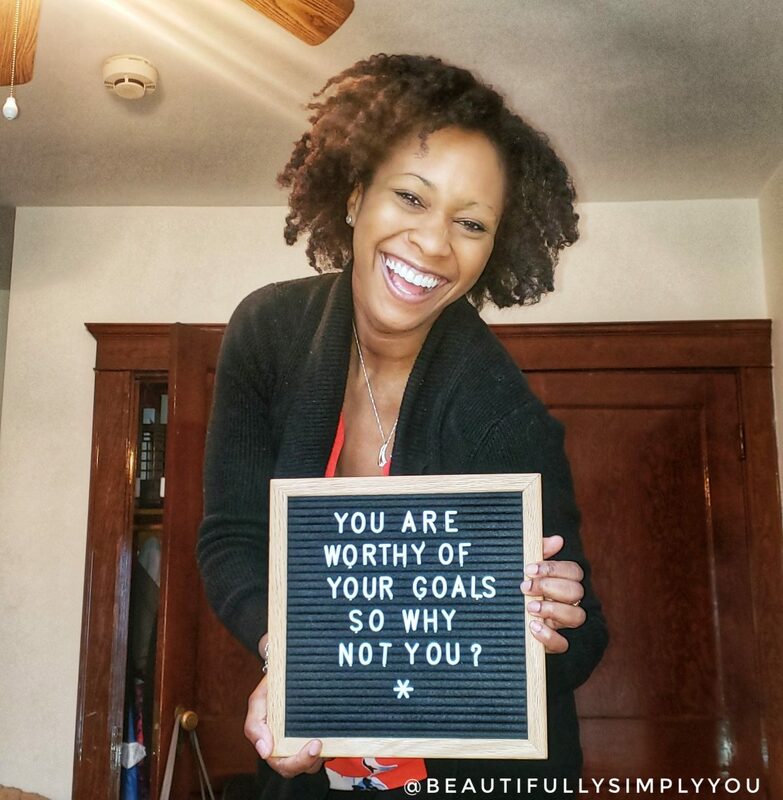 I am challenging you (and myself) to change your mindset from thinking you are not worthy of reaching your goal to remembering that it should be you, exactly as you are, that should, can, and will succeed. You have the ability to grow, flourish and be the change in this world. So why not you? I believe in you, more than you know. It should be you. It will be you.